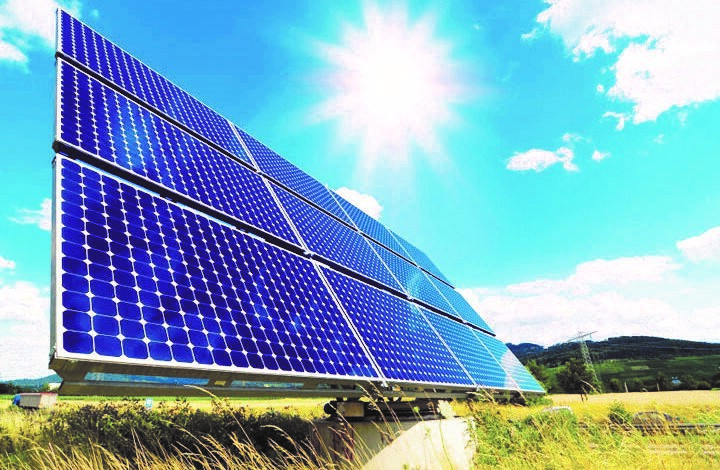 Solar Energy is one of the booming fields in the renewable energy sector. Due to effects of climate changes, Green energy summits across the globe have shown enthusiasm about solar energy policies. 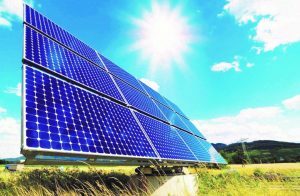 Land owners and industrial giants are willing to invest in the solar energy sector with an eye on profitable returns on investment and positive image created by reducing carbon footprint. General belief is that more sun light gives more generation irrespective of weather condition, which is apparently true, but fact is that we cannot ignore the importance of environmental factors such as, temperature and wind speed that significantly influence solar energy generation. Generating solar power may seem facile but, when you start analysing each aspect of a solar plant one could find it quite riveting. Generally, we expect good generation from solar panels during summer, because the insolation received over the panels will be higher. Analysis, shows it is not too beneficial; Plants sometimes struggle to meet expected generation numbers. Here temperature comes into the picture. While expecting higher generation with higher insolation we often ignore the fact of higher module temperatures which lead to lower than expected Solar energy generation. According to climatic conditions in India, Polycrystalline modules are preferred in most of the regions. Hence, as per the working principle of polycrystalline modules one cannot expect higher generation numbers during high temperature days. Hence, temperature correction is important while evaluating generated units. Generally solar power plant performance is measured by a parameter called “Performance Ratio” (PR). This is the ratio of total generation for a time-period to maximum generation possible for the available DC load with available insolation during the same period. 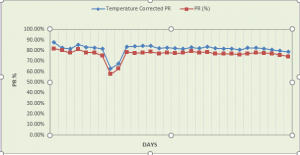 Here we are giving one-month PR and corrected PR value for a 60MW plant (calculated by eqn 1 and 2), and the average difference is about 4% between Normal PR and Temperature corrected PR. This difference may vary month to month depending on weather condition. From the above data we can infer that it is very much required to evaluate Solar Power plant performance according to the weather condition. In this study we have only considered the main aspect of weather i.e. Temperature, but other weather parameters like wind speed, wind direction, humidity have their own influence on the solar panel performance. Hence, if major influencers among these weather parameters are taken care off while evaluating generation units then it will give a more a realistic and accurate PR value. Module cleaning is going fine.. any other ideas..
To calculate actual module o/p you need to know the power coefficient of the modules used. For example, if you have 150Wp modules and your ambient temperature is 40deg C and power coeff. of module is -.40%/deg C , then the actual module efficiency will be 150*(40-25)*( -.40%/deg C) which is equal to -9% . hence real o/p will be 150*9% = 136.5Wp. So while designing the plant we need to know this actual o/p of modules and then design accordingly.